Many end users may feel that operating their compressed air system at high pressure will achieve better results. Unfortunately, their confidence in a high-pressure system is misplaced — higher pressure does not lead to improved performance but merely increases power consumption, thus decreasing energy efficiency and leading to thousands of dollars per year in energy losses. Historically, most industrial facilities have run their air compressors at about 100 psi — but in recent years, the average has risen by 20 psi. However, generating air at 120 psi requires 10% more energy for the same volume of air (in accordance with the industry standard rule that says every increase of 2 psi requires approximately 1% more power). To ensure you aren’t wasting valuable kWh or jeopardizing your energy savings, it’s important to know how to regulate pressure in accordance with your applications. User error is one of the most common causes of over-pressurized compressed air systems. Operators are often unaware of the pressure at which their machine is running. Keep in mind that very few industrial applications require air above 100 psi, and there are almost always opportunities for pressure reduction. Other causes of high operational pressure include poor pressure control on the machine, which can create pressure fluctuations and pressure overcompensation, and a shortage of storage, which can lead to the creation of artificial storage with increased pressure. Faulty machine piping and attachments — common among end-use connectors, filters, hoses, and more, may create pressure restrictions and prompt overcompensation. In other cases, operators may be running their compressor system at high pressure to compensate for other technical issues that have gone unnoticed. For instance, air leaks that are difficult to detect may be causing pressure losses that lead users to hike up pressure. At times, air hoses for pneumatic tools may be too small — causing increased demand for pressure in order to power the tools adequately. In a similar vein, the makers of a critical tool or piece of production machinery may sometimes specify higher-than-necessary pressure. Increasingly, engineers and designers of industrial pneumatic tools are indicating higher pressure requirements in order to slash the one-time cost of the tool’s internal parts. Smaller regulators, actuators, valves, and other critical internal components are used to save manufacturing dollars — but these smaller components require higher pressure and thus raise operating prices for end-users. As such, just one pneumatic tool like this can require users to run their entire compressed air system at a higher pressure than is necessary for other tools and applications. To reduce artificial demand and over-pressurization within your compressed air system, the best solution is thorough, regular auditing. 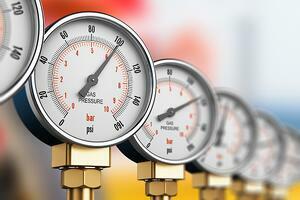 Monitor your pressure gauges carefully and always err on the side of lower pressure. Survey your machine regularly for hard-to-detect air leaks, piping and filtration faults, and attachment valves and hoses. Ensure you use reputable, well-reviewed pneumatic tools that do not cut corners by using cheap internal parts and come with high pressure demands (as a general rule, any tool requiring over 90 psi during operation is a bad bet). Though you are likely to detect some opportunities for repairs, upgrades, and pressure reduction while examining your compressed air system, a professional servicer can complete a more comprehensive audit. An audit is a cost-effective and value-adding option for ensuring you are not losing more energy than necessary. Hire a professional for ultrasonic leak detection services, a complete component audit, and an expert opinion on pressure regulation that will help you mitigate artificial demand and maximize your energy savings.